Track 12 (TT 24:14 min) contains a hidden track (starts at 17:09 min). The cover actually misnames track 7 as "The Persuation Cannel". 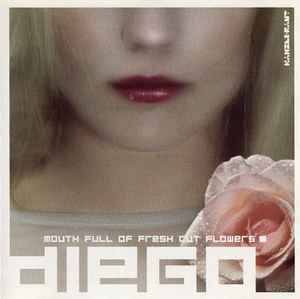 Hard, driving techno on Diego's MOUTH FULL OF FRESH CUT FLOWERS. Classic tech-house bangers, done up with a bit of German shimmer -- you can hear the warmth amongst the beats on "Lines Of Forces," for instance. And even in the more dancefloor-oriented tracks, like "Contact In Context, Pt. 1" or the tickety "Face," the melody remains, even if it seems secondary to the rhythm. The long tones of "Remember The (Geoff Mix)" seem to hover in the air, while "Grounded," surprisingly, has wings. And the final track, "Green Potion" slows the tempo down into some smooth breaks (or at least until the hidden track thunders into being). But if there's a major flaw to the album, it's the segue (or lack thereof) between tracks. The tracks are merely jammed together, end to end, without a real mix or even a fade-out. The transition from "Final Sequence" to "Principia" is so abrupt that it hurts my ears, and the move from "Contact In Context, Pt. 2" to "The Persuasion Channel" aren't even matched by tempo. And as good as the individual tracks are, they aren't served well by the slipshod presentation.